Headlines this week announcing the approval of a new immunotherapy treatment might be raising expectations of cancer patients everywhere. But unfortunately for most patients right now, nothing will change. The new treatment by Gilead, called Yescarta, is the second CAR-T cell therapy to become commercially available. Both are only available in the U.S. and only for a subset of patients — adults with a form of lymphoma and children with acute lymphoblastic leukemia (ALL) — who don’t respond to the standard chemotherapy regimes. But it does signal an important direction in cancer therapy overall — the first of what scientists predict will be a new toolkit of genetic, viral and immunotherapy options. “It’s different than the standard of care, which generally is you get treated with chemotherapy, and it’s an ongoing kind of treatment,” said Bell. 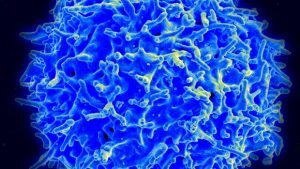 The CAR-T cell approach uses the body’s immune system to attack cancer by genetically manipulating a patient’s white blood cells and then reinjecting them. The procedure is risky, and some patients have died from the devastating immune response. “This one can be pretty challenging,” Bell said. “We’re trying to find ways to make it better. But the upside is that if it works well you could be cured of your disease. The new therapy is also expensive, priced at almost $400,000 US for the treatment alone. After adding in all the medical costs the total price has been estimated to exceed $1 million per patient. In Canada, scientists are hoping to start CAR-T trials within the next year or so. “We’re certainly pushing it forward as fast as we can so people in Canada will have a chance to access the therapy,” said Bell, who is scientific director of BioCanRX, a research network based at the Ottawa Hospital that is funding some Canadian CAR-T projects. Bell estimates that there at least a dozen research teams are working on CAR-T cell therapy in Canada. See the full CBC – Second Opinion article here.